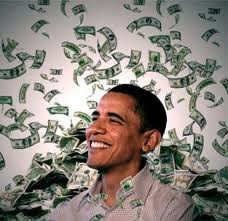 The Midnight Review: Obama Put His Money Where His Mouth Is. When people like President Obama or Warren Buffet talk about the wealthy paying more taxes conservatives usually respond "If you believe in paying higher taxes, why don't you send the government your higher portion?" We all know Warren Buffett has used his vast fortunes for numerous philanthropic endeavors (as has other extremely wealthy individuals), but it has just been revealed that the president - yes, the president - has written personal checks to people in need who had written to the White House. Got problems? Tell Barack Obama. He can help. He might even give you money. On more than one occasion, the president has cut personal checks to struggling Americans who've written to the White House, according to an excerpt from a new book by Washington Post reporter Eli Saslow about the ten letters the president reads every day. "It's not something I should advertise, but it has happened," the president told Saslow. How many times has President Obama intervened on someone's behalf, and with what kind of problems does he help? Mortgage payments? Medical bills? And when he wants to help someone out with a personal check, how does it work? Does he send a check signed "Barack Obama" directly to the individual in need, or does he send the money to a bank or company on the person's behalf? Do people even know when Obama has helped them out, or does the help arrive anonymously through a lawyer? The White House declined to answer any questions about the practice. "Some of these letters you read and you say, 'Gosh, I really want to help this person, and I may not have the tools to help them right now,'" the president told Saslow. "And then you start thinking about the fact that for every one person that wrote describing their story, there might be another hundred thousand going through the same thing. So there are times when I'm reading the letters and I feel pained that I can't do more, faster, to make a difference in their lives." Considering the wealth of some of the GOP presidential candidates, how charitable have they been in the past? Although Mitt Romney has given millions to charity, most of his donations had gone to the Mormon church, and we know how they spend their cash. While Herman Cain used to donate to charity, once brokering a deal with the YMCA of Greater Omaha and a struggling youth center over 20 years ago, his donations has since subsided with politics taking a greater percentage of his donations. Not only that, since Cain assisted the struggling center it has since parted ways with the YMCA and is barely getting by financially. In recent years, Cain has written more checks to political causes and candidates than to charity. But the former businessman and conservative radio talk show host had chosen in years past to focus his philanthropy on education for inner-city youth so, he has said, they can overcome poverty and racial discrimination the way he did. Apparently, his involvement is worth more to him as an example of his personal charity in his stump speeches. Rick Perry's charity appears to be confined to his role as governor handing out jobs and contract to his big dollar donors. The only Republican candidate who seems to be as generous as they claim to be is John Huntsman, who operates numerous charities with his fortune. Huntsman, his wife, Karen, and their nine children have donated $350 million to various causes in the state, he notes. Time magazine listed Huntsman last year as the sixth-largest philanthropist in the United States. Huntsman's leading effort is the Huntsman Cancer Institute at the University of Utah Medical Center. Both of Huntsman's parents died of the disease and he has survived two episodes of it himself. Huntsman plans to build a cancer hospital next to the institute, which sits about a mile away from his corporation's headquarters, high on the city's eastern foothills. But his touch is felt in many other areas: the annual Huntsman World Senior Games in St. George, the Huntsman Awards for Excellence in Education that annually give 10 Utah teachers $10,000 each, homeless shelters, sanctuaries for abused women and children, to name a few. Because Republicans love to talk about the free market taking over the responsibilities of some government entities and helping those who have none but few practice what they preach, but they love to criticize the president who does appear to practice what he preaches.